A passer-by spotted smoke coming from the roof of St Mary's Church around 6.20 am this morning. The BBC Dorset news story states that some damage has occured to the roof, but the firecrews in attendance, including Maiden Newton's own crew, were careful in avoiding any further damage to many of the church's historic features, some dating from the 12th century. 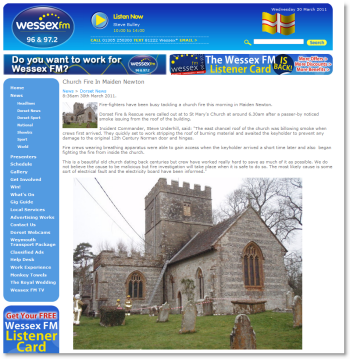 Wessex FM have also run a story and features a number of photographs of the damage caused. Click here to go to their page. You can read a detailed description of St Mary's church here.